Spawned from the elite ranks of the stormtroopers, the Shadow Troopers were infused by the dark side of the Force to carry out the Empire's evil plans. This authentic replica recreates the classic trooper's look. The black jumpsuit is made from a polyester blend and zips up in front. Velcro pads rest on the shoulders of the jumpsuit for securing armor in place. Each piece of armor is molded and shaped to look like realistic stormtrooper armor. The shin guards fasten around the lower legs with Velcro. The left piece features extra detailing near the knee. Armor fits over each thigh with a Velcro strip that attaches into the torso armor. The right thigh piece features extra detailing near the bottom. The front torso armor comes in two pieces that are attached together with elastic bands to allow for movement. 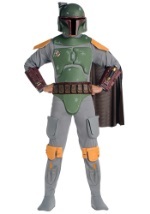 The top part features chest armor with shoulder straps that attach to the back armor with Velcro clasps. 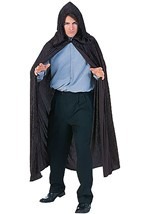 The bottom part covers the crotch and features a flexible, molded belt that fits around the waist and clips over the back torso armor with Velcro. A black canister also attaches to the belt for additional detail. Two black boxes hang down to accent the piece as well. The back armor also comes in two black pieces that are attached with elastic bands. The bottom piece fits over the buttocks and attaches to the front torso armor with a Velcro strap. The top piece covers the upper back and clips into the front piece with Velcro. The arm armor for each arm features three pieces attached together with an elastic band. The upper arm piece and forearm piece both fasten into place with Velcro along the sides while a molded knuckle guard fits over the included black polyester gloves with a Velcro clasp. A set of black pauldrons fit around your armpits with and elastic band and fasten into place with a Velcro strap. 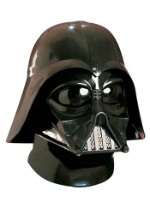 The black helmet is made from a single molded piece that has tinted visors at the eyes to allow for vision (the eye visors appear black, not silver as depicted in the photo) and slits near the nose and mouth for breathing. 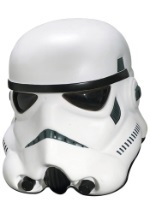 It recreates the look of shadow trooper helmet with complete authenticity and has silver detailing in the front. Your Star Wars collection is sure to stand out with this unique piece.